Are you starting some of your own seeds indoors? 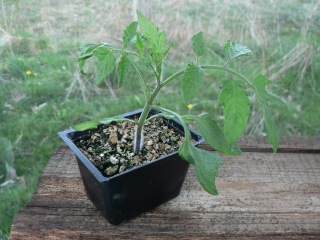 Or planning to check out your local nurseries or big box stores for some vegetable transplants? These are both great ways to give your garden a head start. 1. Some veggies grow best in cool weather. Cool season veggies like cabbage family, onions, spinach, and lettuce grow best in the cool spring weather. Often the garden is too wet or still under snow in early spring so planting a veggie transplant that was started indoors in late winter will give the plant a head start to grow and produce before the warm weather comes. 2. Weeds grow faster than seeds. Some vegetables take a long time to germinate (for example onions can take up to 21 days to germinate) most take up to one week in ideal conditions. Often weeds will grow faster than most seeds. The weeds crowd them out or as a new gardener you do not know what is a weed and what is the vegetable seedling. We have all been there. 3. Vegetable seeds need varying temperatures to germinate. For example heat-loving seeds like tomatoes, peppers, eggplants need a soil temperature of above 24 degrees Celsius (72 degrees Fahrenheit) to germinate. This would mean you would have to wait till July in most northern climates for the soil to be warm enough for the seed to germinate. •	Use only healthy transplants. A sickly plant will not grow well and a diseased one may spread the disease and cause problems in your garden in the future. •	Moisten the garden soil before planting. •	Give the seedlings a watering before transplanting as well. A seedling with moist soil will be less stressed when it is put into the ground. •	Be gentle with plants as they can be easily damaged. •	Always give the seedlings a gently watering once they have been planted. This will help the roots to get established. When your plants are small their leaves and stems can be easily damaged if watered with a heavy spray so again gently water them. 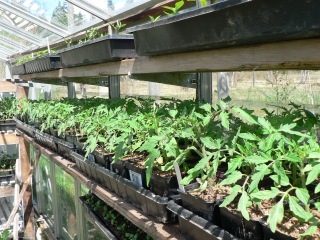 •	Transplant seedlings on overcast days if at all possible and if there is a chance of light rain that is even better. Transplants love to be watered naturally by a light rain. If it is sunny, transplant in late afternoon or early evening when the sun is cooler so the young seedling will not get burned by the heat of the day. 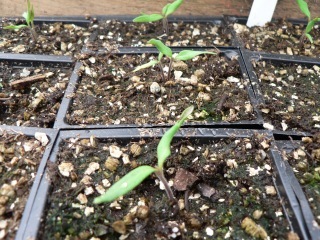 •	Don’t let the transplanted seedlings dry out. Their roots are very shallow so watering daily is usually needed as the top few inches of the soil will dry quickly even in cool weather. •	You need to carefully watch the seedling for the first few days after planting; watching for insect or pest damage is important especially for store bought transplants. Remove anything that is diseased. •	If there is a possibility of a cold spell, a heat wave, or a heavy rain it wise to protect the young transplants in the first few weeks of planting. Some easy ways to protect them your transplants. I have another road trip planned for June. I am heading to Western United States , if anyone is interested in having me stop by for a visit I would love to hear from you.